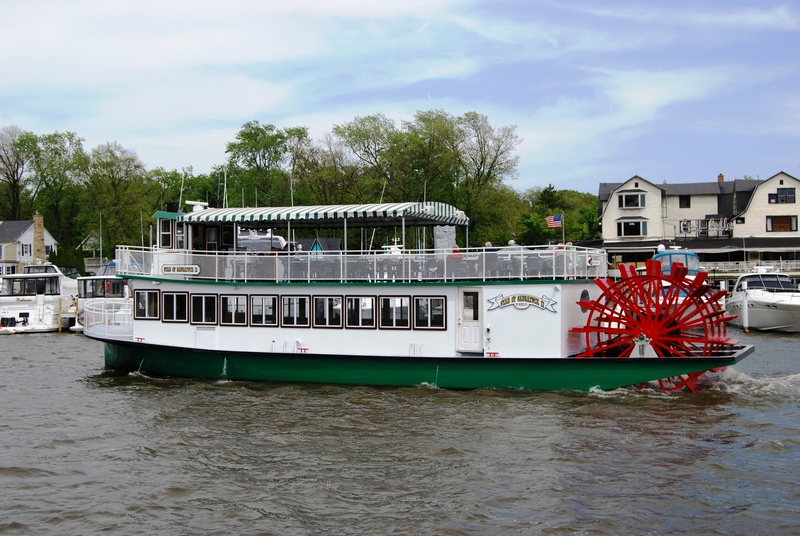 For our first cruise of the season we decide to head south on Lake Michigan to the town of Saugatuck. Leaving the Grand Haven piers, we find almost perfect conditions out on the lake. It is a beautiful day with lots of fishermen out in hunt of the salmon. IT is running well and it is an easy three hour trip. This is our first time to Saugatuck and being unsure of the depths, we are cautious as we approach the two breakwater walls. The lake is down over a foot this year due to lack of snow over the winter. We find almost twelve feet at the entrance and are soon traveling up the peaceful Kalamazoo River. It is a pleasant two mile journey up river to the town of Saugatuck as we pass many opulent summer homes lining the banks. Just past the village of Saugatuck, the Kalamazoo River opens up into the Kalazamoo Lake. We find a nice spot to drop the hook just off the town docks. We spent three nights enjoying our tranquil anchorage on Lake Kalazamoo. Our new batteries preformed like champs keeping everything running. 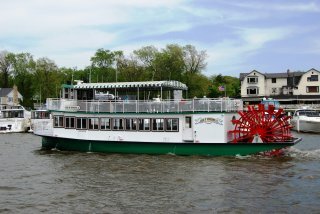 Each afternoon at precisely 1:00 and 3:00 PM, we would be treated with the sight of The Star of Saugatuck, an authentic 80- foot long stern wheel paddle boat, as it cruised the languid waters of Lake Kalazamoo with waving tourists aboard. 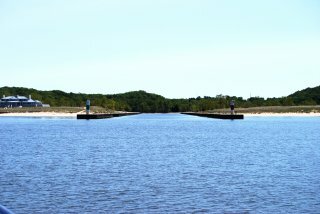 Just off the town park is a dinghy dock and we made several daily trips ashore. 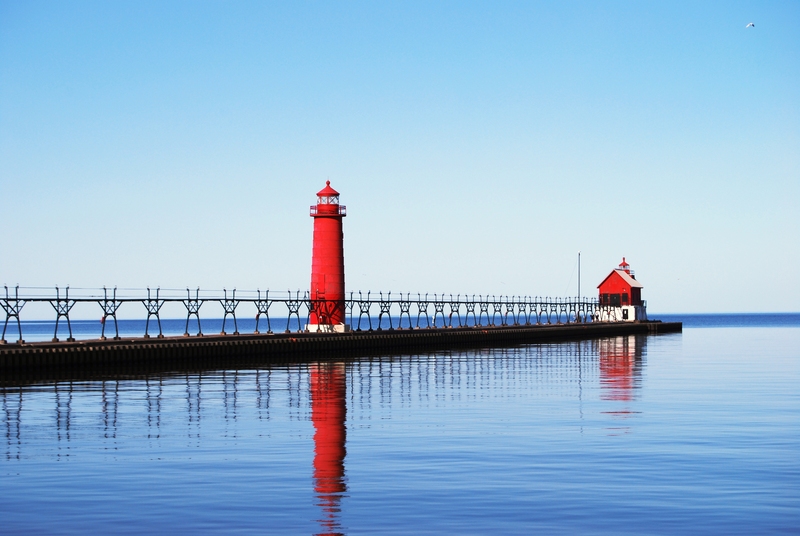 This region is known as “The Art Coast of Michigan” with its many galleries and art studios. Sebastian especially enjoyed the shops as most were dog friendly and even offered him treats. He now eagerly peeks his head in each shop door looking for the nice person with treats. Along with the multitude of shops, there are many fine restaurants lining the downtown streets. The award winning Everyday People Café located just across the lake in the small village of Douglas was a highlight of our trip. The Chicago Tribune had summed it up with “If you could only have one meal”. We had a magnificent dinner here one evening and would agree with its high ratings. Both the service and food were exceptional. Overall our stay here was very enjoyable and we hope to stop here again later in the season. Like our trip south, our return cruise north to Grand Haven again finds Lake Michigan to be flat and calm. If only she could be this way all year! We have another great day on the water and are soon back in slip #59. This entry was posted on June 1, 2012 at 7:42 pm. You can follow any responses to this entry through the RSS 2.0 feed. You can leave a response, or trackback from your own site. 1 Response to "Grand Haven to Saugatuck"
Enjoyed reading the update on the journey from Grand Haven to Saugatuck! Is then when you caught the salmon. Hope all is well. Love you guys!